If you love the idea of a picnic cooler for special functions, parties, and camping trips but have been scared off by their price, this Jockey Box Conversion Kit from Kegco is the fast and easy solution that is guaranteed to save you money. 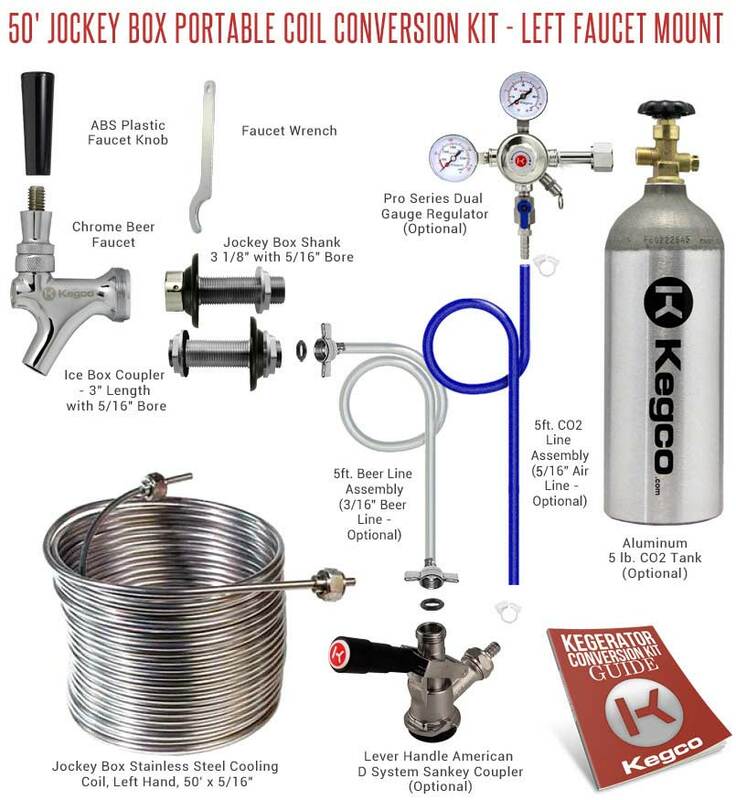 Kegco provides all of the high quality draft beer components you'll need to successfully build your own Jockey Box Cooler - you just need a 25 quart or larger Igloo or Coleman Cooler that can accommodate a 50' Stainless Steel Coil, a screwdriver, a drill, and a crescent wrench. Using our detailed instruction guide, drill a hole in the front to mount the shank and faucet and one in the back for the ice box coupler assembly, which connects directly to the keg through a jumper line assembly. Before you know it, you'll be enjoying refreshing cold draft beer whenever and wherever you want it! This coil is designed for use in an ice-water bath to chill beer down to the ideal dispense temperature of 36-38° F. It is 50' in length and the tubing is 5/16" O.D. x 1/4" I.D. 304 grade stainless steel. This coil is set up to be used on the left side of a jockey box so that the faucet is on the far left end of the cooler. It can also be place on the right side of the jockey box to have the faucet positioned in the middle of the cooler.